Gavin Creel and Jared Gertner play Elder Price and Elder Cunningham in The Book of Mormon. Gavin Creel has previously appeared in the West End as Claude in Hair at the Gielgud Theatre and as Bert in Mary Poppins at the Prince Edward Theatre. Creel received Tony Award® nominations for his roles in the Broadway productions of Hair and Thoroughly Modern Millie. Jared Gertner was a member of the original Tony Award®-winning Broadway company and has previously been seen on stage in Spelling Bee at the Circle in the Square Theatre and in Ordinary Days at the Roundabout Theatre. Gertner has also been seen on TV in Ugly Betty and The Good Wife. 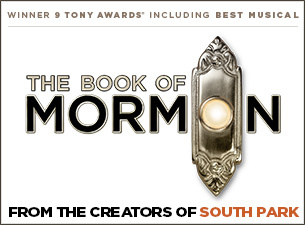 The Book of Mormon comes from South Park creators Trey Parker and Matt Stone, and Avenue Q co-creator Robert Lopez. The Book of Mormon, winner of nine Tony Awards®, including Best Musical, and the Grammy for Best Musical Theatre album, follows a pair of Mormon boys sent on a mission to a place that’s a long way from Salt Lake City.